Both of my sons ran Cross Country in High School. I was looking through the Going Places cart and noticed the running figure and it reminded me of watching their teams compete. 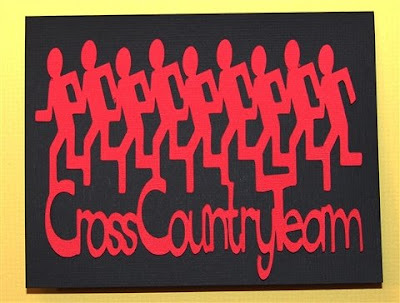 I don't know if anyone reading this is a runner or has a child on a Cross Country team - it is a difficult sport to "watch" since the runners follow a prescribed route "across the countryside" and, in my experience, they only pass by the observers a few times during the course of the race. However, I do have a few photos of their meets to scrapbook and so I made this title. I hope some of you can use it. The first page of the file has the design as I created it, adjusted proportionately (using the lower right corner handle) to a few sizes. 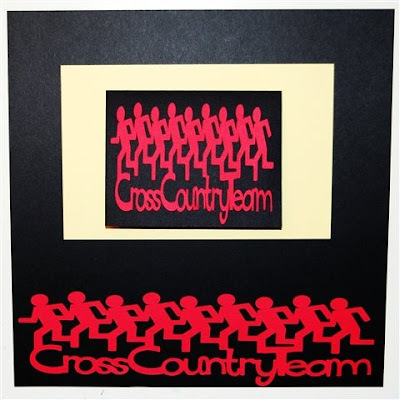 On the following pages there are versions that are sized for a 12 x 12 border (shown above), an 8 x 8 border, a 5 x 7 card and an A2 card (shown below). You can alter this type of design by entering the height and width that you want for your project in the Shape Properties box but be aware that the resulting design may appear distorted if it is greatly different from the original aspect ratio. Above is a screen shot of the original design to compare with the test cut versions above. As you can see, the runners are shorter and wider in the 12 inch border and taller and thinner on the A2 card. The final page of the file has card sizing rectangles for the A2 and 5 x 7 cards, just for convenience. Well, I love all your designs and thank you for sharing them. I'm doing the "happy dance" though, because my son was a cross-country racer and I'm about to scrap those pages--yeah, the very few pictures I was able to get as he wizzed by! Thank you, thank you, thank you! My five year old son and seven year old daughter both just finished their cross country season. This cut if perfect, thanks so much for sharing all of your talents and designs. Thank you for the Cross Country cut file. I am so thrilled! I need to start scrapping my son's season this year! Thanks! You are so talented! I just wanted to say thank-you. There is not much out there for cc. A bit of Word Fun!